To view seventeenth-century portraits currently for sale at Philip Mould & Co, please go to www.philipmould.com. This distinctive portrait is characteristic of the work of the Kersebooms, uncle and nephew, originally from the Rhineland, who came to England in the early 1680s. Frederick, the elder of the two, had been a pupil of Charles le Brun in Paris, and then, reputedly, of Poussin1 during a fourteen year stay in Rome. He had intended to make his career as a history painter but, typically of the experience of foreign painters arriving in England, he was to discover little encouragement in that direction, and adapted himself to the predominant fashion for portraiture. His nephew, necessarily, pursued the same career. The work of the two painters is very similar and has still to be satisfactorily distinguished; Collins-Baker2 considered Johann to be the superior painter, and at his best, as in the Portrait of Robert Boyle (versions: Royal Society; Royal Collection; Private Collection formerly with Historical Portraits, London) achieves profound and insightful characterisation. The present portrait of a gentleman displays the elegant pictorial rhetoric typical of Kerseboom portraits. The gesture in the tilt of the head and the expressive action of the hand represents an unspoken communication with the viewer, and conveys courteous diffidence, representing in the static world of the painting the mannered gestures and conversation that were the expression of gentlemanly conduct in late Stuart society. 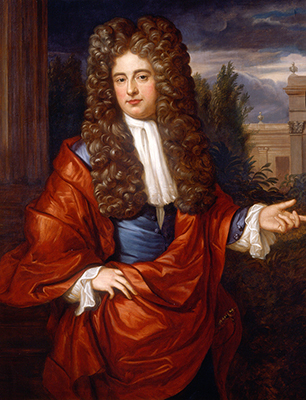 This pose was considered characteristic by Collin-Baker3 in examples such as the magnificent full-length Portrait of Francis Duke of Bedford (formerly at Hardwick Hall), and also in the Portrait of Captain John Dawes (Finborough Hall). The treatment of the hands in their suggestion of plumpness is also distinctive and can be observed in these portraits, and also in the Portrait of a Lady with a Squirrel and a Spaniel (Private Collection formerly with Historical Portraits, London), a painting whose landscape background is perhaps among the most lyrical and harmonious in the painter’s oeuvre. The background of the present painting displays a comparable handling of the trees, but the execution is broader, and resembles that in the Portrait of Richard Gomethan (Christie’s January 29th 1982 lot 91), which employs the same framing pillar to the left, and similar Italianate architecture appears in the background. In the present portrait the architectural element is more dominant, and although the extensive building with Corinthian pilasters may never have existed outside the painter’s imagination it advertises the sitter as a man of education, familiar both with the classical past and with its direct heir, the most modern architectural and cultural taste on the Continent. Frederick Kerseboom died in March 1693 and was buried in St Paul’s Covent as ‘Frederick Casaubon.’ The date of his nephew’s death in not known, surprisingly perhaps, since his portrait practice was larger. Eight mezzotints after his paintings are known, which indicates a thriving commercial business, as does his collaboration with Jan Van der Vaart who painted the drapery in some of his portraits, and who had earlier worked with Willem Wissing in the same capacity. Johann Kerseboom’s prices may be a good guide to his ranking among his fellow painters; in 1694 he charged £16 10s for a framed half-length portrait4. Kneller, the most fashionable of portrait painters was charging almost double at the same date, but Michael Dahl charged twenty guineas for the same size in 1711 and in 1709 Charles D’Agar had been paid only twenty two guineas for a three-quarter length group of a woman and her two children.5 We are grateful to Tabitha Barber of Tate Britain for proposing an attribution to either Johann or Frederick Kerseboom.